Qiu Ying 仇英 (attr) (1494–1552), Ode on Shanglin Park 上林賦 (detail) (1531-38), ink and colors on silk handscroll, 53.5 x 1183.9 cm, National Palace Museum 國立故宮博物院, Taipei, Taiwan. Wikimedia Commons. 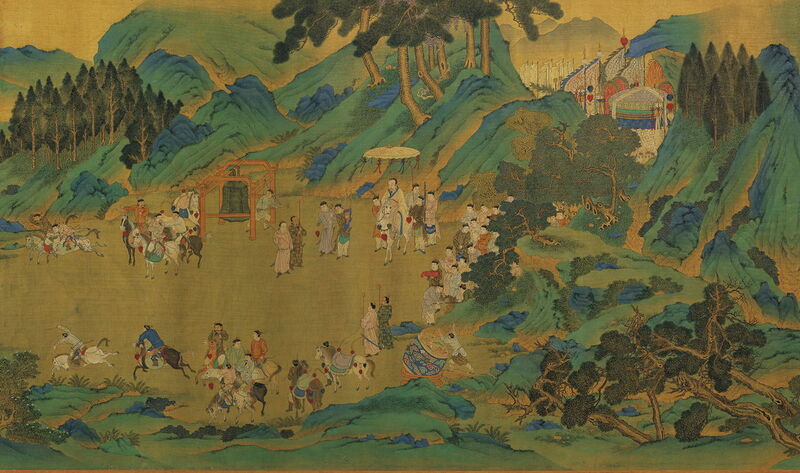 The third and final example of narrative painting on a Chinese handscroll is, I think, the most beautiful. It is attributed to Qiu Ying 仇英 (1494–1552) during the Ming dynasty, although there is some doubt as to whether this particular handscroll was painted by him. It is one of three copies: this is in the National Palace Museum in Taipei, Taiwan, which has a second copy dated just a few years later. There is also a fine copy in the Freer Gallery of Art in Washington, DC. The artist bases his narrative on a famous fu or poetic ode of the same name, written by Sima Xiangru 司馬相如 (179-117 BCE) for the Han dynasty emperor Wudi. At that time, Shanglin Park was the rich hunting ground near the then capital, situated in northern central China. The story of the poem is itself something of a legend. Sima presented himself before the emperor, and submitted that he wished to compose a grand fu in honour of the emperor’s excursions and hunting. Sima was provided with a supply of brushes and bamboo (on which to write, as this predates the invention of paper). So the poet produced his major work, which is thought to have originally been named Fu on the Excursions and Hunts of the Son of Heaven 天子遊獵賦. The emperor was so pleased with Sima’s fu that he immediately appointed him to his court. 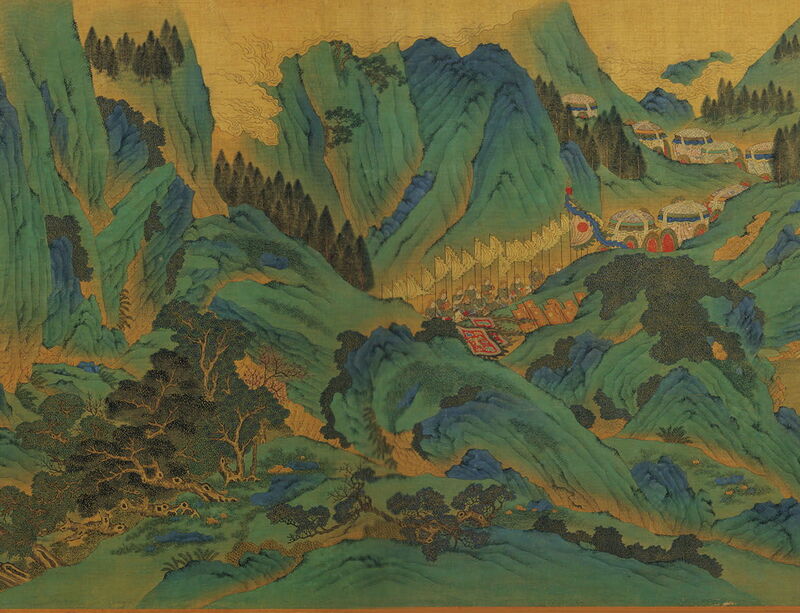 Qiu Ying 仇英 (attr) (1494–1552), Ode on Shanglin Park 上林賦 (1531-38), ink and colors on silk handscroll, 53.5 x 1183.9 cm, National Palace Museum 國立故宮博物院, Taipei, Taiwan. Wikimedia Commons. Overall, the painting is in blue-green style with a great deal of fine brushwork, and this copy is in excellent condition. The ode starts with a discussion between the Duke Wushi and two nobles, which leads into an introduction to the Emperor’s Shanglin Park. This opening scene in the painting shows the three seated together in a fine house set among rugged mountains. Below the cloud fills the valleys, but breaks sufficiently to reveal a town in the upper right. Sima next lays out the bounds of Shanglin Park, and embarks on a long and lyrical description of the area, starting with the waters and their abundant marine life. This is shown in the second scene of the painting, where there are fish in the turbulent river, and waterbirds flying over it. The ode continues with detailed descriptions of the mountains and gorges, many wild animals, different types of horse, the emperor’s palace and various pavilions which lie within the park. This third scene is an exquisitely detailed landscape encompassing the varied terrain and other items which Sima lists in his poem. In the distance, beyond the pavilions, cloud hangs low in the valleys, and only rocky peaks project through. Having taken over 250 lines to describe the park, Sima starts to detail its use by the emperor and his court. As autumn turns to the start of winter, the emperor travels from his palace to go hunting. He is in his carriage, which is decorated with carved ivory and drawn by six jade dragons. With it goes his great cortège, led by his nobles, and bringing his retinue. The fourth scene shows just that: to the left of centre, the emperor’s chariot has just been drawn by six white horses through a narrow gorge. As the cortège reaches a small plain, it opens out, showing the members of the court paying their respects to their emperor. Behind a long series of mounted escorts follow, bearing banners. The imperial procession then snakes its way through winding mountain passes, as shown in the fifth scene of the painting. The procession arrives at another small plain area, and a drum is beaten to signal to the hunting party to disperse. This sixth scene shows the massive drum being beaten just below the centre, and at the left the hunters cantering off. The emperor’s carriage and main body are still making their way through the narrow pass, at the upper right. The hunters have now dispersed across the whole landscape, where they pursue all manner of different game, including big cats, foxes, and bears. Qiu’s depiction in the seventh scene is not quite as ambitious in terms of big game, although just below the centre a group of archers are in hot pursuit of a fox-like animal in its white winter coat. Further in the distance, and slightly to the left, four men carry what looks like a large deer attached to a pole. With the hunt drawn to a close, the hunters gather near the emperor’s grand marble belvedere. A large orchestra plays music to accompany his nobles in dancing. The emperor becomes lost in his thoughts about the future, and how he will eventually die and return to be interred in his park. He orders his staff to open the granaries and stores to ensure that the poor are properly fed. The eighth scene in the painting shows the marble belvedere standing proud above a layer of low cloud. On it are the emperor and his concubines. Towards the right, the nobles dance. The emperor gets into his carriage, and it is driven off on a tour of the six ‘classic’ locations across the park. After further eulogy, the poet rounds off the work by returning to the three nobles in discussion. The final scene in the painting shows the emperor’s carriage and cortège passing along the edge of a river or estuary. There are ships at anchor, and areas of padi cultivation at the water’s edge. In the distance are more pavilions and houses, surrounded by a blanket of low fog. The story in Sima’s ode is not so strongly narrative as the two previous paintings which I have shown in this series, and more of a topographic description followed by an account of a day’s hunting. Qiu has shown this as a series of separate frames which have been blended to appear as a continuous landscape. Because of the simplicity of its story, the handscroll would probably still make sense in the absence of Sima’s poem. But I suspect that a co-ordinated reading and viewing of the painting would be a remarkable and almost cinematic experience. Laurent’s new book is a revelation. By bringing together these, and more, handscroll paintings with the texts on which they are based, he shows clearly how Chinese painting was – at least on occasion – fluently narrative. I hope that more studies will appear in the future. Posted in General, Language, Life, Painting and tagged China, Chinese, handscroll, landscape, narrative, painting, Qiu Ying, Sima Xiangru. Bookmark the permalink.